Vancouver Startup Wantering: Google For Fashion? You’d be surprised how many data points there are when it comes to shopping online. When you take into consideration data across the web and then across the social web we’re talking about hundreds of millions of data points. While the normal shopper can’t analyze or look at all of those data points, sometimes shopping for clothes online can easily result in 30 or 40 open browser windows. This can get ugly, confusing, and slow your computer down. A Vancouver startup called Wantering is hoping to help solve your fashion faux pas, by analyzing over 100 million data points for you in what they call the “WantRank” algorithm. Whether you’re shopping by deal, brand, category, color, print, fabric, or any other category, wantering can help narrow down your search and point you to the best deal. Then, the web platform can take you to a destination to purchase. The team behind Wantering all came from the online retail world and they’ve spent years combing through and analyzing data. We got a chance to talk to Wantering Evangelist, Kathleen Ong. Check out the interview below. Ever try to shop online when you’re not quite sure exactly what you’re looking for? We’ve been there. Wantering helps shoppers find clothes they’ll love through our fashion search engine. Save yourself the wasted time and frustration of opening up multiple browser tabs, wondering if something is on sale or in stock, and trying to shop from tiny thumbnails. You can shop for clothes by brand, category, materials, prints, and color across a curated list of boutiques, flash sales sites and major retailers all in one place. And if you’re curious about why something is at the top of a search result, it’s because of our WantRank algorithm. WantRank tracks and analyzes over 100 million data points across the social web and ranks products based on what’s getting the most social-love. The Wantering team are no strangers to online shopping. Wantering’s CEO is Matt Friesen, a technology industry veteran. Matt was previously the founder and CEO of Thirdi Software, a custom software development shop specialized in building eCommerce stores and web applications. Matt started Wantering in 2011 after Thirdi Software was acquired by Invoke Media (the creators of Hootsuite). Nick Cairns is Wantering’s head of UX and was previously the Director of User Interface & Design at Move Inc (the parent company of Realtor.com). Jesse Sherlock is Wantering’s CTO, and has experience building highly scalable systems for Reinvent (one of the largest domain owners in the world) and the BC Lottery Corp. Nicholas Molnar is the head of product, and was previously a web strategist at Thirdi Software. Nicholas sits on the board of directors of F Cancer and has been a speaker at numerous technology-focused events including TedxVancouver. Wantering is based in Vancouver and New York City. Vancouver is known as Silicon Valley North. There is a great startup scene here with a growing community of startups, investors and accelerator programs such as GrowLab, which Wantering went through in 2012. In New York, we’re based out of General Assembly. Wantering was selected as one of six startups to be part of the Canadian Technology Accelerator (CTA) New York program this fall. We’re looking forward to meeting people and getting to know the New York tech community on a more intimate level. We get the best of both worlds; participating in Vancouver’s growing tech scene is such a rewarding experience and travelling to New York, where the industry is much more mature, has been eye-opening. We’re solving some of the most basic problems in online shopping. Where do I look for a new pair of shoes? What’s on sale from my favorite designer? Where can I get a blue cocktail dress for this wedding I’m going to? Wantering gives shoppers a beautiful platform to discover and buy clothing by pulling together the best e-commerce stores all in one place. Gigantic images, detailed descriptions, trending products, and up-to-date stock and sale information make shopping less time consuming and more fulfilling. We believe searching for clothes online has lost its way. The results you see in leading product search engines are typically paid posts by retailers. One look at Google Shopping and you’ll find a big notice in the corner explaining exactly that! Not to mention, they don’t understand my style taste, and they completely disregard current trends in fashion. Can you name two new features in product search since the ’90s? Shopzilla launched in 1996, Yahoo Shopping in ’97, MySimon in ’98, and Nextag in ’99. They’ve barely changed since, and are somehow still billion dollar businesses. We think this is an area ripe for disruption. On Wantering.com we put the best products first by using 100 million data points from the social web, and we aren’t going to sell our users out. There is tons of room for innovation in this space, and we’re excited to be building something really cool to help people shop online better. There’s been quite a few big milestones for us in the last 18 months. Releasing our search engine in spring 2013 was a one of the biggest moments for us; it’s both rewarding and motivating to see what you’ve been working on for months come to life. There is still more work to be done and we’re looking forward to what’s ahead. We have some cool product features in the works over the next while, so we’re excited to get those out! People in Waterloo come up with some amazing ideas. Although we often joke about RIM/Blackberry these days, back when they first came out they created an entirely new industry, one that still has renewing legacy customers. By putting customers’ messaging abilities, calendars, and digital lives in the palm of their hands and making it all sync wirelessly with the office, things were easy and efficient. Although RIM has stopped innovating, Waterloo has not. Enter WestonExpressions, a Waterloo-based startup behind a new wireless digital, interactive advertising platform called Linkett. Now I’m definitely not a fan of big buzz words, but Linkett is really all of those things. It may be what the world has been looking for in the form of new advertising. 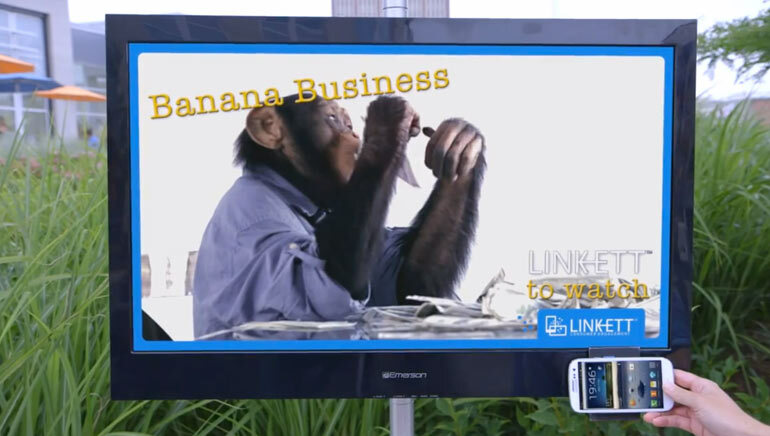 Linkett allows you to let your phone interact with many different types of digital advertising platforms. It can be an ad on your computer screen, a bus stop sign or even at the mall. You can use Linkett to walk through an exhibit and download the music playing. Users can use Linkett to download an author’s book while at the bookstore. You can even use Linkett to get a mall directory by just swiping your phone in front of a display. Really, the possibilities for this new advertising platform are limitless. “The attention span of the average consumer in today’s world is at an all-time low due to “media clutter.” People can’t remember things that were advertised to them on a TV or a billboard like they once could and therefore traditional digital signage ads are less efficient. We solve this problem by making all content interactive and easily accessible for consumers while providing key analytics to promoters. Online ads provide analytics to advertisers so they can boost ad effectiveness, so we want to provide the same type of data and service but in the real world,” the team told us in an interview. To get an idea of this new level of interaction check out the video. WestonExpressions is a technology corporation providing hardware and software innovations for the out-of-home advertisement industry. Douglas Lusted is the CEO and co-Founder of WestonExpressions. Douglas founded the company in 2012 after winning the University of Waterloo’s Innovation Showcase and Velocity Venture Fund in his second year of business studies; leading to the development of Linkett Technology. Ashok Patel is the COO and co-Founder of WestonExpressions. Ashok is a computer scientist that graduated from the University of Waterloo and currently handles hardware engineering and operations. Ashok is a serial entrepreneur who previously co-founded Softart MicroSystems which was acquired by BlackBerry, where he was team lead for the GSM/GPRS radio protocol stack implementation team. Vlad Pisanov is the CTO and co-founder of WestonExpressions. Vlad finished Hon.B.Sc in Physics from the University of Toronto and obtained his Master’s Degree in Computer Science from the University of Waterloo. Vlad’s previous work experience includes outdoor advertisement agencies and developed the core backend system of Linkett. Kitchener is very tech intensive, and has a common theme of new mobile technologies especially at the Communitech Hub and Velocity Garage which serves as our incubator. There are a lot of software companies, and great engineers from the University of Waterloo. There is a much more “west-coast” vibe around a lot of the companies compared to New York or Toronto for example. After BufferBox was acquired, Vidyard and Thalmic raised high series A rounds of funding, it really attracted some talent and investors in the area. Digital marketing is the fastest growing channel of marketing and the technology in mobile devices is rapidly innovating. There is a critical shift in how consumers shop, obtain information and are entertained and it is being reflected in how they engage with brands, and with digital screens. We think it is the perfect time to improve digital screen technology so it can keep up with consumers and their mobile devices. In our first week we have reached many milestones. We closed our first round of funding from VC Firms and angel investors and also reached over 50,000 hits on YouTube. We have two international protected Patent applications and sold units internationally in the United States, Canada, Peru, New Zealand and Ireland. Our next milestones to reach include continuing to drive sales in North America and penetrating the retail market. We will finish product development and ship Linketts to those who have pre-ordered as well as launch our next generation Linkett that offers payment not only through mobile devices, but also through loyalty and credit cards. You see we weren’t kidding when we told you that Everywhere Else Cincinnati was going to be the place for startups everywhere else. We’ve made a top tier conference affordable for bootstrapping startups all over. Our nearly 30 speakers are the caliber of speakers you would find at tech events in San Francisco, New York, and London. Today we have the privilege of announcing that Lightbank associate James Dickerson and mobile guru and untether.tv founder Rob Woodbridge have joined the lineup of amazing speakers for the conference. 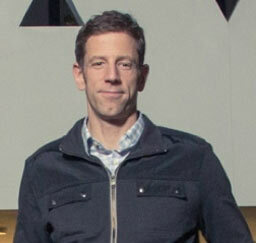 James Dickerson is the founder of Brandery alumni startup Leap. Starting a company is nothing to him, though. Immediately after college he spent 30 days in the desert with just a blanket, a knife, and a poncho. He then cut his teeth in the sales world as a beer salesman, and anyone who’s ever done that knows how hard it can be. He created a startup called Wellthy that was accepted into The Brandery and then came out as Leap. Dickerson wasn’t content with being a startup founder. He wanted to make a difference and an impact so he used a pitch deck to get his current position as an associate at LightBank. Lightbank is no stranger to startups everywhere else. Built on the success of Groupon, their portfolio reads like a who’s who of startups from everywhere else: Belly, BenchPrep, Zaarly, SpotHero and Contently don’t even scratch the surface when it comes to their top tier portfolio companies. To tell you the truth we were scared to book Rob Woodbridge. By his own admission he “never stops talking.” It’s good talk, though, and he’s preaching the entrepreneurial gospel and the gospel of mobile rockstars. His technology story starts in 1993 the year before Netscape released the first mass market web browser. He started one of the first internet service providers in Ottawa, the kind that you dial into their servers (Never mind you may not know what I’m talking about, but this was a big thing before you ordered internet from your cable company). That company started building custom software applications by 1998 (if you’re keeping score that’s when Mark Zuckerberg was 14). In 2000 Woodbridge founded a company called getHOW. Soon after the internet bubble burst, and Woodbridge then linked up with SystemScope. After that, he joined OCRI’s Entrepreneurship Center to run the Ottawa Capital Network. Now he’s the founder of untether.tv which is dubbed “Casual Conversations With Mobile Rockstars.” He’s also the three time emcee of uxcamp Ottawa. That makes 23 awesome speakers we’ve announced so far, with a couple more big announcements next week. Now would be the time to get your early bird discount ticket or your startup’s early bird Startup Village booth. Here’s the list of speakers we’ve announced so far. Imagine if you lived in a game. No, not virtual reality or something you could play on Google Glass, but if you had a game to complement your real life? That’s what Canadian entrepreneur Philip Barclay is doing with his latest startup, appropriately called “YourExtraLife. 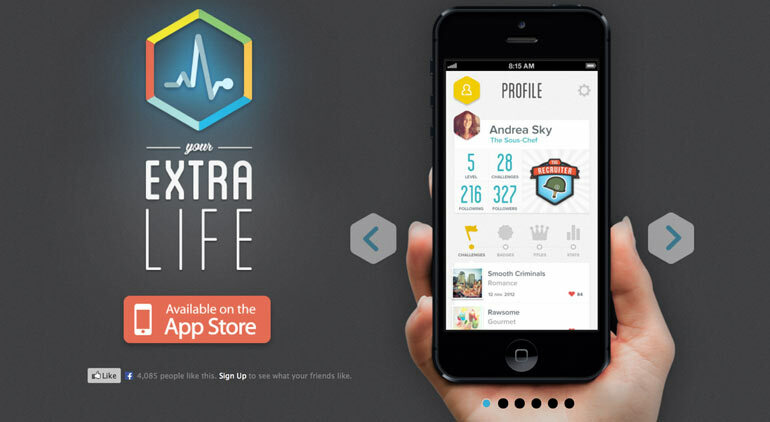 “YourExtraLife is a game for real life. It’s all about venturing out of your comfort zone and trying new things, inspiring your friends, and discovering inventive people. You complete creative real-life challenges by taking pictures, and you unlock harder and harder ones as the community validates your photos,” Barclay told Nibletz. YourExtraLife essentially takes a mobile online game and brings it offline, which seems to be a popular trend with startups these days. We got a chance to talk with Barclay about YourExtraLife. Check out our interview below. YourExtraLife is a game for real life. It’s all about venturing out of your comfort zone and trying new things, inspiring your friends and discovering inventive people. You complete creative real-life challenges by taking pictures, and you unlock harder and harder ones as the community validates your photos. We already released a total of 125 challenges for 5 different themes: romance, culture, nightlife, altruism and gourmet. Philip Barclay – CEO – Studied Advertising, had a blog with 200k+ readers. Takes care of the growth and marketing strategies. Gheorghita Catalin Bordianu – CTO – M.Sc. in Computer science from McGill. 4 years of experience in startups, used to be the Platform Director at Silentale. Takes care of our platform. Samuel Chenard – CFO / Designer – Studied accountancy (yes!) – Takes care of the design and the video production. We’re in Quebec City right now. The routine and the passivity. We realized a lot of people needed more incentives to try new things and get out of their comfort zone. It was the perfect moment: mobile phones are powerful (and intelligent), millennials get bored easily and they are looking to be mind blown, brands are looking for new ways to reach/connect with people on their phone, social medias made a lot of people passive. -We launched a kickass product. -We made it to the front page of the App Store in several countries, including Canada, U.S.A., UK, etc. -We reached 10k users in under a week. -We have a major partnership with one of the biggest music festival in the world: Le Festival d’été de Québec. -Some major blogs (The Next Web, TechVibes) covered our story. This Boston startup gamified the asthma inhaler for kids. Scott Annan was frustrated with the lack of connection between authors and learners when he set out to create Accel.io, an online platform for creating interactive guides viewable across an array of devices. Annan is no stranger to rallying the appropriate resources to help build Accel.io. In Ottawa, Canada, where Annan and Accel.io are based, Annan’s involvement in his local startup community is that of a leader. He ran a small accelerator last year and has brought together his community to provide mentorship and direction to cultivate a strong community in multiple areas. Annan is also part of the change in shifting Ottawa from being a hardware-focused city in the 90s to that of the consumer focused, software-oriented city it is today. After rebuilding the Accel.io platform early this year to make the platform easier to use for anyone to create their own Accel.io guide, Annan says he and his team are now focusing on expanding their content into that of “health & fitness, professional development, relationships, and even home improvement.” By expanding the content of Accel.io, Annan hopes it becomes a great way to learn in all areas of life across the world. The ease of interacting with authors, taking notes, and interacting with embedded media make Accel.io a natural fit for a wide variety of subjects. Annan is optimistic for Accel.io’s success and potential moving forward as it continues to dramatically grow. With a focus on interactivity and usability, Accel.io hopes to break past the wall that eBooks and traditional books have hit. 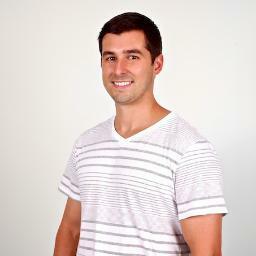 Michael Luchen is a student at the University of Kansas and project coordinator at Cremalab. You can find him at his website or on Twitter @mluchen. Wearable technology and “the internet of things” may be the hottest startup segments out there in 2013. There are sensors, gadgets, bracelets, bands, watches, and other technology that captures just about everything. There’s even wearable, sensor-based technology for dogs. Most people have seen fitness monitors, sleep monitors, and smart watches, but from what I’ve seen (and I’ve seen a lot), Myo, the flagship product from Canadian startup Thalmic Labs, takes the cake. 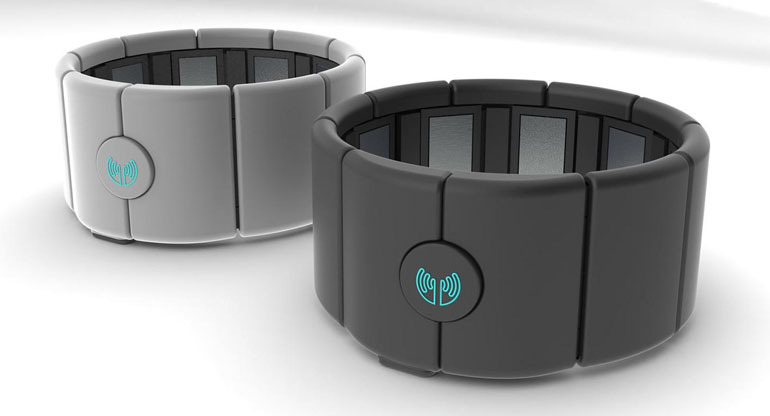 Myo is a bracelet that has sensors built into it that allows you to gesture control just about anything using the motion in your hand. With Myo you can easily scroll through a presentation deck, navigate a website, or pinpoint a place on a map. Then there’s the even cooler stuff. Myo can also help you control video games and even fly smartphone- or computer-based helicopters and airplanes. When I first watched their demo video below I thought it looked kind of silly, but really it’s one of the awesomest things I’ve ever seen. Myo eliminates the need for so many different remote controls and controllers. It’s also intuitive and the gestures (from watching the video) are natural, the gestures you would be doing on a smartphone or tablet anyway. Sure the Wii Remote, XBox Kinect, and even Roku’s latest remote control are all about motion, but they are also tied directly to their device. Myo makes your hand the motion controller, I know awesome right. We got a chance to talk with the team behind Myo. Check out the interview right below their video. Thalmic Labs is a rapidly growing company that is dedicated to the development of gesture control, wearable technology and human-computer interaction. Our flagship product, MYO, has already received 30,000 pre-orders, and continues to generate a massive amount of excitement about the future of wearable computing. At the University of Waterloo, Stephen, Matthew and Aaron graduated with degrees in Mechatronics Engineering. Stephen was named one of Canada’s Top 20 under 20 in 2007 and one of the Next 36 entrepreneurial leaders of Canada in 2011. Stephen graduated with an additional certificate in Entrepreneurship from the University of Toronto, and studied as a visiting scholar at the Swiss Federal Institute of Technology Zurich. He became an entrepreneur from a young age, attaching LED lights to radio-controlled trucks and selling them at age 13. Matthew studied pattern recognition, which drove the development of the underlying machine learning magic behind Thalmic’s products. He studied as a visiting scholar at the Swiss Federal Institute of Technology Zurich. Aaron has an extensive software engineering background, having spent time in Silicon Valley working for Zynga. His passion for software engineering has even led him to create his own embedded microprocessor operating system. How do we connect the real and the digital worlds as we move towards wearable and ubiquitous computing? MYO provides a way for us to interact with and control computers and other digital devices directly using our hands. Fundamentally, Thalmic is attempting to close the gap between humans and technology. The applications are endless, including gaming and entertainment, industrial, healthcare, education, business, and general user applications. The video that we launched MYO with has millions of views on YouTube and gave us immediate reach when getting our product out there initially. More recently, our company announced the closing of a Series A funding round at $14.5 million – the largest round of funding that any post-Y Combinator company has received to date. This funding will be used to fuel continued growth, further product development of MYO, and develop future products and technologies from Thalmic Labs. The most important milestone for us is to get our final product into the hands of thousands of waiting customers. This includes taking our time going to production to ensure the quality of our product and finding the best partners to do this with. Another big milestone is to get early units and documentation to developers late this summer and see how they can help rethink human-computer interaction. Beyond that, we’re excited for the future of technology. For us, MYO is a first step down a long path in this direction. The best way to understand Thalmic Labs and MYO is by watching the video on our homepage (https://www.thalmic.com/myo/). As you explore, feel free to “get updates” and pre-order MYO at https://www.thalmic.com/myo/preorder/. You can follow Thalmic Labs on twitter at @Thalmic. Back in October Kara Swisher said sensors were the big thing for this year, she was right. Drunk driving is a serious problem. Over the past five years or so, various companies have been able to put breathalyzers in the hands of those drinking alcohol. People can even purchase retail breathalyzers as a fail-safe way to make sure they are “ok” to drive home and not impaired. In other cases the justice system hands out breathalyzers to those convicted of drunk driving. Often times those breathalyzers are tied into the cars ignition system to make sure the vehicle can not be driven if the driver is intoxicated. A Montreal startup called Sobersmart has incorporated the use of a smartphone with a breathalyzer to make it even smarter. Sobersmart is part hardware in a fob-sized breathalyzer (pictured above) and part app readily available from the App Store. The app can function as a standalone without the breathalyzer component. -PARENTS / KID: In a parent / kid setup, the kids use Sobersmart wherever they are before driving and the parent app gets a notification and a variety of options for their safe return. You can even get your car’s location if you have to pick it up later! -DRIVER: The driver setup is the classic breathalyzer mode. It measures your blood alcohol level and provide you with alternatives to get back home safely if it’s elevated. -TAXI: Under the TAXI configuration, a taxi driver is hailed automatically by the Sobersmart app. It accepts payments straight through the app, draws funds from the prepaid taxi account, or allows a parent or friend to sponsor a cab ride if someone is short on cash after a long night. Sobersmart is currently crowdfunding $75,000 for their first production run. The team has already won several accolades including winning “The Grandmother Judges Panel” at the International Startup Festival. They also ranked top 3 overall at the ISF. Check out their crowdfunding link here and for more information visit their website here. Here are three ways to improve your startup pitch from a founder who’s raised $1 million dollars. The “crowd” has been used for a variety of things in the startup world lately. There are startups utilizing the crowd to find the best restaurants, events, websites, and even parking spaces. We got the chance to talk with Berlin startup ParkTag in May during TechCrunch Disrupt NY 2013. 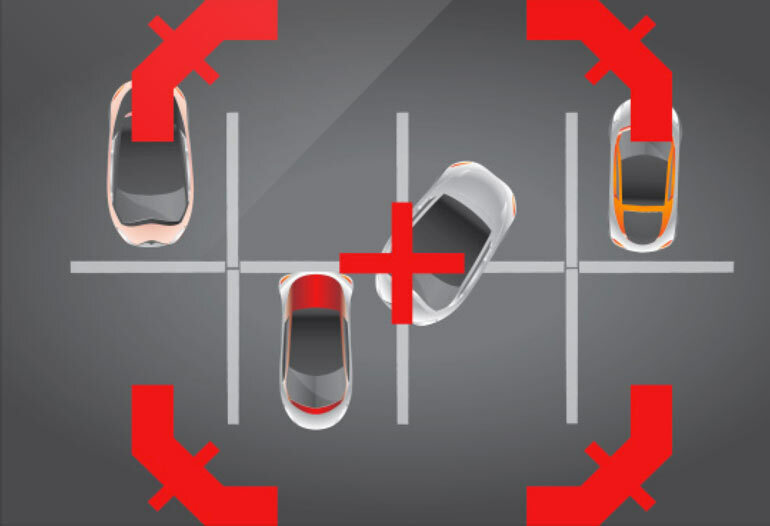 Their company uses the crowd, or rather a peer-to-peer platform, to help people police themselves and find parking spots. Now we’ve heard about Canadian startup SpotSquad that is using the crowd to snitch on people who are illegally parked. Of course it’s frustrating to find someone double parked outside the mall or the local WalMart. It can even be frustrating seeing someone with a nice car, and two perfectly working legs, park in a handicapped parking spot. SpotSquad, developed by a 10 person team in Winnipeg Canada, is an app that allows vigilantes with a smartphone to report people who are illegally parked. What’s in it for these good Samaritans? Well, according to the Daily Mail, the people who report these traffic violators will receive a portion of the fines collected. The DailyMail reports that users with the SpotSquad app installed will take a picture of the violating car. The picture is then tagged with a GPS location. The reporter then assigns the picture a violation, and it’s uploaded to authorities. The reporter and SpotSquad will get a portion of the fee collected. As reporters report more and more violators, their cut of the fees will increase and their ranking will increase within the system from Private to General. The company plans to begin a beta test of the app next month in Winnipeg. This Canadian startup has a new way to display brands for marketers. Last month we got the chance to talk with the founders behind New York startup Docurated. They were pitching on the battlefield stage at TechCrunch Disrupt NY. Their idea is to provide enterprise with a way to easily search and find content within volumes and volumes of files, information, and presentations wherever it’s located. Last October, we interviewed the team behind Canadian startup TagMyDoc. Their simple, easy to understand platform does almost the same thing, but they’re positioning it for everybody. In looking at the two products side by side Docurated seems perfect for what it’s designed for. I’d say their best use cases would be big PR Firms and marketing units within big enterprise companies where multiple people are collaborating on projects and need to be able to quickly search through excerpted content. TagMyDoc lets you organize your content, wherever it lives, whatever way you want. I like this for a lot of reasons too, customization being the number one reason. From a user like me though, this can be overwhelming at times because sometimes I forget how I organize stuff. Take my mess of Gmail folders for instance. 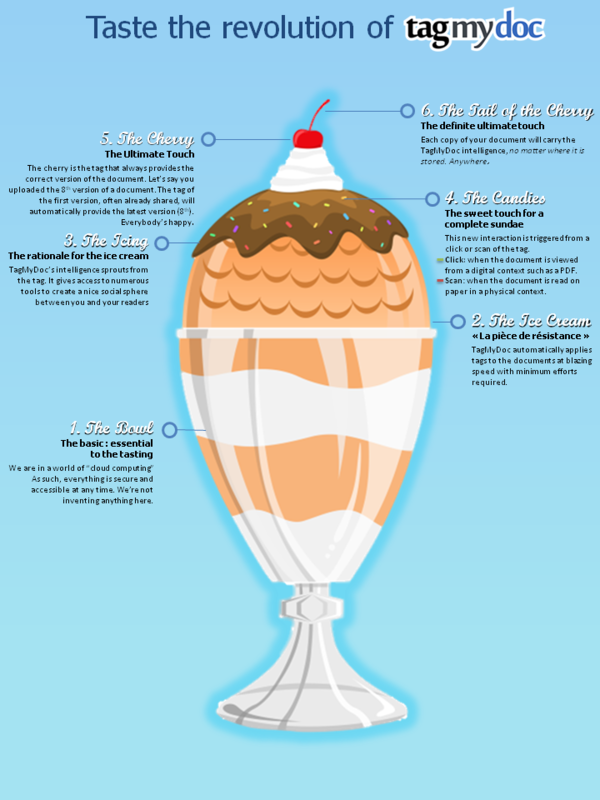 At any rate, TagMyDoc has come a long way in the last 7 months since we interviewed them and just in time for summer they’ve released this really “sweet” infographic on how far they’ve come. See I told you it was sweet. You know what we like for organizing, this is the startup we like for mobile email. Kayak is one of the most awesome sites in the world for travelers. On one big screen you can compare flights, cars and lodging by price and provider. It’s great if you’re on a budget but if you’re bootstrapping and hitting the peer 2 peer sites there hasn’t been a place to offer similar comparative information. Montreal based developer Hamed Al-Khabaz, recently launched a new startup called Outpost or outpostp2p.com. It’s the Kayak for people looking to take advantage of p2p travel. Right now the site give you access to Vayable, RideJoy and Airbnb, but according to Al-Khabaz via reddit and social media, they are looking to add just about every peer 2 peer travel service available. Outpost is made up of three easy steps. Using outpost you know where you can use each of the services individually or in tandem. If you’re using airbnb why not do some ride sharing too, it just makes sense. Once you pick your destination using Outpostp2p.com you’re taken to a map that shows you all of the various p2p travel services available to you. While Ridejoy obviously moves about a city, in cities like New York you can use Outpost to compare Vayable and Airbnb side by side. It also gives you a quick rundown in a list on the left side of the page with current accommodations by price for both services. While this was admittedly a side project for Al-Khabaz, with the way it looks, operates and the need for a service like this, it could quickly become a huge new startup. A Canadian startup has taking a format as simple as Hot Or Not and put it online for people to debate the hottest current event issues. After a year in the making, the site officially launched on Monday and so far there seems to be some interest bubbling. Right now the hottest debates seem to be on gun control, Have We Reached Peak Oil and Google Glass. “For comparison sake, a debate is a bit like a subreddit but you have two columns, one for each side. Debates are always polarized like that. People post their opinion, links to articles, blogs, tweets and just pictures as argument on one or the other side. Behind each argument, you have a comment section where people still pick a side when commenting. Therefore, if you see a “red” argument that seems quite good, you can go check in the comment for “red” or “green” opinions below it. Everything is sorted by number of votes so you can “filter” the content and show what’s best in a certain amount of time. We use exponential decay formulas to depreciate argument after a while, depending on filter selection. This keeps the debate interesting by showing more new content. We have no downvotes, because it makes no sense for people arguing.” one of the founders explained. They are hoping to scale the site so that it becomes the platform of choice for discussing hot button issues. 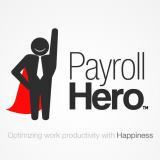 500 Startups, LX Ventures, the Futura Corporation, 8capita Partners, Ryan Holmes (founder of Hootsuite), Dan Martell (CEO of Clarity), Benjamin Joffee and other angels have all backed Philippines/Canadian startup Payroll Hero to the tune of $1 million. Payroll Hero was dubbed the IT Startup Of The Year in the Philippines for their back end HR platform that provides payroll, attendance and scheduling services for companies both large and small. Tech In Asia says that the company is software that makes sure “people actually work”. The company currently has customers in the USA, Philippines, Canada, Cambodia, Singapore, Thailand, Indonesia, Malaysia, and India. They plan on using part of this investment to expand across South East Asia. Payroll Hero was one of 16 international startups to participate in Startup Arena, a pitch contest held over the summer. Ben Joffee, who is sometimes referred to as “Mr. Asia” was one of the judges at that contest and then put his money where his mouth is by investing in this round. More available at the source. A few weeks back when we were at CES 2013 we saw a nifty new startup from Canada called Holografyx. Earlier this month we brought you an interview we did with Russian startup Displair. Their technology created a multi touch display in thin air, which could be the wave of the future. Holografyx is also doing something cool with display. They’ve created a way to holographically super impose text and other graphics on top of wares that are being displayed in a show case. Towards the end of the video you can see exactly what I mean. While it’s definitely not as earth shattering as Displair the technology provides yet another way for marketers to show off to customers. They also have an interesting franchise model to push their “360 cube” show case system to market. Whether you’re looking for a chain coffee shop, a drive through or the shop that serves as a city’s cultural mecca, you can find your next cup of joe using the app from Toronto startup Find Me Coffee. We’re all aware that Toronto has one of the largest startup ecosystems in the western hemisphere, and a lot of that innovation is being fueled by coffee. Find Me Coffee makes it easy to find the nearest coffee shop using your smart phone. We got a chance to talk with the team behind Find Me Coffee. Check out the interview below.